North: ~910 miles to sea. ~1300 miles to Patia. North-East: ~620 miles to Weland Gorge. ~1300 miles to Labyrinth Forest. East: ~1000 miles to Dougton. South-East: ~1700 miles to Casper. South: ~870 miles to Oliver Scudders' Woods. ~1500 miles to Hills of Noddendoddy. South-West: ~260 miles to Cory Scudders' Woods. West: ~670 miles to sea. North-West: ~650 miles to Marlboro Keep. Humans make up most of the population. This is followed by elves, dwarves, anthros, and draconians. Humans make up 55% of the population, elves and anthros make up 30% of the population combined, dwarves make up 8% of the population and draconians make up 7% of the population. Members of a criminal organization now known as the Abaddon Triumvirate investigate a raid by centaurs which resulted in a kidnapping. They encounter the centaurs, after which one of those three mind control the roving band and force them to become servants of the Triumvirate. The soil in and around Weland is fertile and crops are rotated to keep the soil from losing its nutrients. Aside from grains and foodstuffs, many of Weland’s gardeners and farmers grow medicinal herbs. The growth of so many varieties of medicinal herbs along with the appearance of a well-known natural hot spring, Sazaeshita (spelling) Hot Spring, and a proposed hospital, utilizing Okamura’s Grace, aim to give Casper a run for their money on having the healthiest citizens. 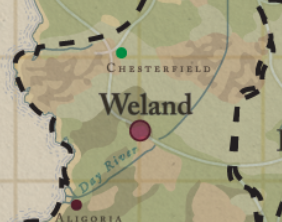 The citizens of Weland are in a state of discontent with their leadership. The view of the common citizen is that the leaders, the Okamura, are doing nothing to help them deal with the plague and the attack on their Lightning Rail. The belief is that the police department is corrupt and undisciplined, despite their officers being relatively well trained. It is common knowledge that most of the police force is made up of those in the higher levels of society that can afford the highest levels of education. Essentially, Weland is a powder keg, waiting to explode. However, the Okamura have been removed from office. A new regent has been elected and so far, things are hopeful for progress. The new regent is seen as being a proponent for change in getting rid of the outdated views of the old samurai family regime. Time will tell. Lightning Rail is a mode of transportation that connects the cities of Terrenus to each other. Unfortunately, it was destroyed in two separate terrorist attacks. The trolleys are used mostly for local transportation. They run on a consistent schedule and are affordable. However, they aren’t known to be speedy. These trolleys do not run at night. Supido Trains are a small subway system that is privately owned. These trains only travel throughout Weland underground. The tickets are more expensive than that of a trolley, but one could pay more for a weekly or monthly rate. The Supido Trains have a characteristic yellow color. The headquarters is housed in a building in the Southern Quarter. The trains run on a schedule that continues throughout the night. Train stations are found in every quarter and each quarter has about five train stations. The trains are very reliable and clean. Bikes are one of the most popular forms of transportation. Many of the busier roads around Weland have specific lanes for bicycle traffic. Traditional carriages and motorized carriages also travel the streets of Weland, but they are expensive and some streets aren’t wide enough for two carriages to travel down them at the same time. Airships are generally privately owned. They are very expensive and there are not many places where an airship can land. The main ferry company in Weland is the Enko Kappa Ferry Company. They are a family owned business that has been around since the founding of Weland. They specialize in delivering freight and also carrying people to and from Weland. The ticket prices often are cheap in the summer and expensive in the winter, as the Day River tends to freeze. The ships must use more gas to break through the ice. Northern Quarter: This is the wealthiest part of Weland. Okamura’s Grace is located in the Northern Quarter. Many of the residents live in siheyuan, homes comprised of villas surrounding a courtyard. These homes are made from clay and wood mostly. The Araki and Okamura reside in the Northern Quarter. This quarter is more traditional in appearance with smaller marketplaces that sell goods that can also often be found in Renmin Square. The atmosphere is peaceful. The crime rate in the Northern Quarter is very low. Western Quarter: One of the poorer regions of Weland. Many of the people in this quarter work on farms on the outskirts of Weland or they work in the steel factories. The homes in this quarter have been formed out of clay and stone by Terran geomancy. These homes look similar to those found in Casper. The crime rate is higher than that in the Northern and Southern Quarters. The people here have adopted an approach of not ratting one another out which makes fighting crime difficult. The Teka District and Rantou are located here. Things that cannot be found in Renmin Square are often sold in the Teka District for a very high price. The Iwanari family call this district home. The shinobi clan, The Karasu, also call this district home. They operate a few shops in the Teka District. The headquarters of the steel industry is found in this quarter as well. Southern Quarter: This is considered one of the modern quarters with large buildings. Most of the population calls the Southern Quarter home. The Southern Quarter is the headquarters of the burgeoning medical field. Medical research and technology is starting to blossom. This is considered to be one of the more hopeful places to live in Weland, as the quarter is changing from being behind in the times to catching up and even surpassing many cities in Terrenus. The crime rate in the Southern Quarter is relatively high, as people see the wealthiness of those in this quarter as an open door to theft. The guards often patrol the Southern Quarter, but there is a growing sentiment for those who prefer to be vigilantes of sorts. The Torii and Bessho reside in the Southern Quarter. Those who live in this quarter live in tall buildings, but none towering over Okamura’s Grace. Eastern Quarter: This is the poorest district in Weland currently. A plague has ravaged the quarter and has killed off many of the younger men and women. This leads to a sense of lawlessness in this quarter. The homes in the Eastern Quarter are siheyuan, just like those in the Northern Quarter. This was once a very prosperous section of Weland. Many of the siheyuan are abandoned. This quarter houses Kabukicho, which now has many empty theaters and closed down bars. Many of the businesses were bought by Chizuru Ryuzoji-Xanathi in an attempt to rejuvenate the theater district. The headquarters for the shinobi clan, Kakushigoto, and Chizuru’s own home are in the Eastern Quarter. The guard rarely visits the Eastern Quarter. Weland is bordered by mountains to the north, and almost surrounded by forests to the south. The city enjoys a temperate climate with cold winters and hot, humid summers. Winters have the potential to be harsh, with cold air being blown down from the mountains. The city often sees snowfall, but not to the point where it is constantly buried by snow. The spring tends to be cool and rainy. Summers are often hot and humid. Thunderstorms are not at all uncommon, due to the clashing of cold air from the mountains and the humidity from the city. Fog often rolls down from the mountains and blankets Weland with fog overnight that burns off with the rising sun. The Day River is a large and powerful river stretching from Scudder's Brother's woods to the tip of Weland Gorge. It ranges between 5 and 17 miles wide at its widest point and branches into multiple rivulets and tributaries along its path. Guided tours on ferries and cruise ships are among the most popular attractions on the River. Talk among the locals found along the River's length has it that a floating carnival has made an appearance and provides entertainment for any who can make it aboard and pay the price, a rate which is unusually low even among the standard ferries and cruises. Rumor also has it that when bottled with a specific ritual, water from the Day River emits sunshine. Weland Gorge is a deep, winding maze that cuts between two mountain ranges. The climates and terrains of these opposing ranges are at constant odds. While down in the gorge one can travel through the dense, cool brush of a forest for miles, and then suddenly find their footfalls met with sand, cacti and the heat of the desert. As odd as the dramatic climate shifts are, it is stranger still that they never stay constant in the same area for more than a few months. It is important to note that with this strange phenomenon in terrain there is also a drastic change in the wildlife one may encounter. Several documented journals tell of encounters with different varieties of fay in the forested areas, while in the desert terrain they have found Tunnel Beasts and man-sized spiders. One entry also tells of a Suujali that stalked a caravan before losing the creature in the vast network of caves. One doesn't need to search very far for a clean source of drinking water should they stay close to the river that runs through Weland Gorge. Clean water flows from many caves and streams along both mountainsides, though they may be more difficult to spot should one encounter a patch of desert, as often streams dry out before reaching the river. The cave network is individually fascinating. There is a huge tunnel system that leads in and out of the mountain ranges and also into large underground lakes. What makes these lakes truly unique is the healing and refreshing properties they carry in their water. This occurs with the help of a rare form of algae that grows near heated magma vents that purify the water and grant restorative properties capable of healing small to medium sized wounds and curing fever and cold. These waters are widely sought after, but it is unfortunate that the properties don’t seem to carry all the way to the gorge’s river where the lakes drain out. In the center of Weland Gorge there is rumored to be an oasis on a highly elevated plateau with a water fall that spills around the entire surface. There has only been one recorded account, but the traveler was alone and could not recall that he had ever written the journal entry. Another, more obtainable destination for the sensible adventurer would be would be the hot springs and cooling falls scattered throughout the many desert and jungle locations in the gorge. A few of these locations are inhabited by local tribes, but there are so many that privacy should not be hard to obtain for couples returning from the Hills of Lost Hearts. The fashion of Weland is constantly changing. These days, the youthful fashions tend to combine traditional robes and hakama with clothing designs from far away places in Terrenus. The population boast a style of dress that is a true melting pot from all over Valucre that is combined with the traditional fashions from the old days of Weland’s founding. Weland’s economy relies on trade with the closest cities of Casper and Dougton. While Patia is a neighboring city, there is not much interaction between the two cities. Weland’s exports include wood, steel, silk, rice, vegetables, and in very rare occurances, water from Saezashita Springs. Casper provides Weland with fish, a very important part of the diets in Weland as well as a way to fertilize farmer’s fields, salt, and iron. Dougton provides Weland with wheat and textiles. While Weland remains a unique city, there are a few influences that are prevalent in Weland’s culture from outside the city. There is a sense of paranoia and superstition in some of the poorer parts of Weland. This stems from their old religion mostly. The city’s leaders wish to have the healthiest population out of every city in Terrenus. They look to Casper and Paul’s Hospital as a model for this. The rivalry is a friendly one where everyone seems to benefit. While Casper is bustling, Weland is more relaxed and many shops sell medicinal herbs and potions for the travel. Much of Weland’s manufacturing goes to making weapons and items to defend the city from outside invaders, such as the inhabitants of the woods around them which see Weland as being a noisy distraction and a brutal killer of the environment. Some do so for foreign religious reasons. For this reason, many common citizens are trained to fight and defend themselves, even women and children. The samurai have long run the society that governs Weland. The typical samurai is of the upper-class. They are few in number, outnumbered by the commoners by a vast margin. Despite their fewer numbers, the samurai are respected. Each samurai is descended from one of the few first families that have inhabited Weland since its founding. Through the generations, the ideals of being a samurai remain unchanged. While maintaining the idea of bushido, most samurai have been trained with more modern weapons, but the sword is the most sacred of all weaponry that one could hold. There are five notable families in Weland. These five families are considered to be the five original families from which Weland was actually founded. Each of these families have a special weapon that is passed down through the generations. These weapons are able to summon a guardian to aid them in battle. However, only one person can summon the guardian and that person is the one whom the weapon rightfully belongs to. Usually anyone else trying to summon a guardian has to face the wrath of the guardian unless it is a dire situation. However, the person who wields the weapon can dictate who they wish to hand it down to. The Okamura- The current ruling family and founders of Weland. This family’s sword gets passed down to the eldest son of each generation once that son reaches the age of 20. The current bearer of the sword is Kazuhiko Xanathi, having been given the blade by Masato Okamura. This sword summons Genbu, the Black Tortoise. The controller of the sword is given the ability to use stone based attacks and defense. The Torii- One of the rivals of the Okamura. Since the eldest daughter of the clan is married to Masato Okamura, there has been peace between the two rival families. This clan is known for their tactics using the fan. The fan is handed down to the eldest female once she reaches the age of 20. The current owner of the fan is Ayako Torii. She is able to summon Suzaku, the Vermillion Bird. The controller of the fan is given the ability to have control over air, which grants its user the ability of temporary levitation. The Araki- This family has typically stayed out of the way of both the Torii and the Okamura as they fought for leadership. Currently, the family is on friendly terms with the Okamura. They are widely known for their skill with the bow and arrow. To choose a guardian, candidates are thrust into an archery competition until the one who is the most accurate from the furthest distance wins. The current one who possesses the bow and arrows that represent the family is Yukimori Araki. The bow and arrows represent Ho-o, the Red Bird. The wielder of the bow and arrows is granted high levels of healing abilities for themselves and others. The Bessho- Another rival of both the Okamura and the Torii. This family has existed alongside the Araki and are often allies with the Araki. The weapon this family is known for using is the naginata, a bladed staff. It is currently wielded by Fumiko Bessho.The naginata is used to summon Byakko, the White Tiger. It is usually the eldest child regardless of gender that is handed the naginata. Byakko allows the user to utilize fire and lightning magic. The Iwanari- This family is on friendly terms with the Okamura, but is known for being double-crossers when push comes to shove. They are not known to be trustworthy, but they are known for being very strong allies, producing very capable fighters. The family weapon is the no-dachi, a very long sword. The no-dachi is handed down to the child who most demonstrates their ability to fight and survive without a weapon. It is seen as a gift to be invited to go on “The Great Hunt”. The guardian of the Iwanari is Zennyo Ryo, the Blue Dragon. The no-dachi grants its user the power over water, to make rain and use water and ice based attacks. The one who possesses this sword is Ginzo Iwanari. The samurai clans are older than Weland itself. All of them once worshipped Yomigane no Ookami at some point. The Torii were the first to convert to Gaianism, which started the rift between the Okamura and Torii. Slowly, the Torii were able to convert the Iwanari to Gaianism and the families fought amongst one another. It wasn't until the Araki had converted that the Bessho and Okamura converted to Gaianism. Following the teachings of Gaianism, the Okamura buried all evidence of Yomigane no Ookami’s worship along with the worship of her pantheon. Those who have been chosen to wield the weapons of the family guardians are considered to be guardians of the city. These guardians take great pride in protecting the city in a more vigilante type style. Unfortunately, it can be difficult for the group to put politics aside sometimes to fight together as a cohesive unit. Anthromorphic creatures are a bridge between humanity and the spiritual world. More will emerge since that delicate thread is threatened between them and the humans. If it's broken, the humans become vulnerable to the Youkai. Due to the contract with Yomigane, the first anthromorphic beings were given specific abilities that are connected to their ties with nature. For example, a fox-like being may be tied to the West, with abilities connected to preserving nature. Other beings might be simple shamanic creatures, whom devote their lives to serving Yomigane, but can only go so far as to healing, or cleansing. In the beginning, the Samurai made a contract with the anthro community, in hopes of strengthening their community against the rise of the Youkai. Family is very important to the anthromorphic creatures and they will go through great length to defend the next generation. Advancement in rank can be a family affair and considered a great honor for all of those involved. Children can be raised by the community, or the parents may decide to place their own views, or morales on the offspring. With this type of thinking, it is no surprise that clans develop based on situational circumstances. Clan wars between the anthro’s are commonplace, but may not be seen by outsiders such as humans, etc. Unless the clan war encroaches onto human territory, the anthro’s choose to keep the politics between themselves. In regards to politics with humans, they take their contract with them seriously. In fear of disappointing their Goddess/God, they will go to great lengths to aid their allies. In times of strife, it is not uncommon to see warring clans embrace one another, even if they might have a strained relationship. In order to keep the balance, they will neglect their own personal goals and put their doctrine first. Education is shared by the community and even with their allies. Military plays a huge role in the anthro community. From a young age, an anthro may choose which branch they wish to excel in. If the child is from a known military family, their fate may already be decided due to tradition, or expectations of the family unit. Ranks are earned through performance in operations, or by deeds recognized by the council. Rivalry between individuals is not uncommon and can lead to unsavory results. Unless the clan is outspoken against Yomigane, most will join forces for the greater good. Home life is more than likely comfortable for a young anthro. Raised by several in the community, they will gain the necessary skills that they will need for the militant lifestyle. Education is taught with a strict regime that reflects military values. Temples are regularly visited and many young anthro take part in community festivals. Some choose to leave the community, even though it is strongly advised against. If they choose to cut themselves off completely, the community will no longer recognize them as their own. This can be especially heart-breaking for the parents and immediate family. Technology speaking, anthro gain the knowledge from their fellow Samurai, or community at the time. Some may be more experimental than others, which leads to progression in the community. Fascinated by trade routes, many will seek out the unique creations from foreign lands. Many have a natural knack for tinkering, or smithing. The community encourages their young to explore and educate themselves with primitive and advanced technology. Shinobi are even harder to find than samurai. Unlike samurai, they do not prefer the pomp and circumstance that a samurai would prefer. Their actions are performed in secret, often at night. During the day, the shinobi often act as normal merchants, wanderers, or any other type of average citizen. However, at night, they can become hardened killers. Many shinobi are skilled commoners, which makes it even harder to pin down one shinobi. Like samurai, shinobi operate with clans. Clans have a different power structure than a samurai’s family would. Unlike samurai, most aren’t born with a title of leadership. Leadership is earned by completing missions successfully. Punishment for failure is often harsh and can even include very painful ways to die. It is rare, extremely rare for a shinobi to quit and survive for more than three days, but it is possible. Shinobi typically are only loyal to those who pay them the most either in money or favors. They swear to the mission until the end. Some even carry poison on them to kill themselves with, just so that they could avoid the terrible punishment. The Kakushigoto: This is a clan formed of three families. First is the smallest family, the Ikeda. This family is skilled mostly at poisons and close range combat. The Ikeda are all dragons that masquerade as humans and are considered to be extremely dangerous. The Eru have been part of the Kakushigoto for a long time. Their specialty is disguises and explosives. Ever since the influx of newer, more powerful explosives, the Eru have decided to fine tune it to provide more lethal results. The last family that is part of the Kakushigoto is the Hinode. These people are chameleons, able to blend in perfectly with their surroundings and gather information to aid the other two families that are part of the clan. The Henshin: The Henshin is comprised of two families, the Karasu and the Yakou. The Henshin is comprised of shapeshifters. The Karasu are able to take the form of a crow, while the Yakou are able to take the form of a fox. The two clans have an uneasy agreement, and they both seem to distrust one another. However, the pair do not attack each other and are often seen working together. The Inzen: A clan comprised mostly of shinobi who are not part of a family. This clan operates more like a roving street gang than in the organized fashion of the other two clans. They often are seen unfavorably by the other two clans. Their abilities are largely unknown and believed to be widely varied. The Inzen also are the most numerous of all the clans. Most shinobi are hired by samurai families as spies. Though, occasionally, they are used to collect debts, capture criminals who have learned how to evade the samurai themselves, or to even kill those who are thought to pose a danger to society. Essentially, the shinobi are the “cleaners” of Weland’s society. Unlike the samurai, the shinobi have very little impact on the religious movement in Weland with many clans still worshipping Yomigane no Ookami in secret. Winter Snow Festival: This festival is usually held in Renmin Square. Food stalls open to serve hot soups, stews, and curry. Jade Lake is used as an ice skating rink. Usually during this festival, there is a beauty contest to see who would be crowned Miss Winter Beauty. It is usually judged by “famous” locals. Spring Flower Festival: Bring your prettiest flowers! This festival boasts magnificent creations made with flowers from the small statuette to the large monument. During this time, citizens are encouraged to picnic in the garden outside Okamura’s Grace. Summer Fireworks Festival: The largest festival featuring fireworks! Competitions are thrown, seeing who can make the biggest and best fireworks display. There are games of chance, many food stalls, and even amusement park rides. The city is lit all in red, the color of fire. During this time, there is a large festival at night in Renmin Square complete with music and dancing. Autumn Harvest Festival: The largest food festival in Terrenus! There are food competitions, games, and prizes. Of course there are prizes! Farmers from Terrenus are invited to show off their produce and livestock. At the end of the day, there is a drinking contest. Major tournaments happen twice a year. However, there are always smaller tournaments happening in Weland. There are several syndicates of underground fighters. Some schools exist in Weland that teach explicitly fighting in a certain style. There is no dominant fighting school in Weland as of yet. The two major tournaments happen before the Spring Flower Festival and before the Autumn Harvest festival. The winners of these tournaments are given special honors at the festivals. Okamura’s Grace: A 13-story tower that is/was home to the Okamura clan as they ruled over Weland. The first floor is a public library. The second two floors are administrative offices for the library. The 4th-6th floors contain offices and spaces dedicated to the Weland guards. There are holding cells, an infirmary, and police desks. The 7th and 8th floors are offices dedicated to the city management of Weland. The 9th floor contains the offices of Taiji and Masato Okamura. The 10th-13th floors are were the Okamura family actually resides. These floors boast floor to ceiling windows made from tempered glass, able to absorb bullets. A complex network of Welander steel and other building material meets geomancy to form the tower’s foundation. A magitech system has formed a thin shield of constantly moving air that shields the floors from the 4th floor to the 13th floor to help deter any projectiles from damaging the tower from the outside. The central system controlling the device is located somewhere on the 8th floor. The interior of the building is heavily guarded by droids and human patrols. The higher up the building, the more security clearance is needed. The Hotaka Blossom: This teahouse was named after Hotaka Okamura, the founder of Weland. This tea house boasts three stories, and is considered the most popular tea house in Weland by residents and tourists alike. The Hotaka Blossom is the spot where people can meet with samurai, chatter with beautiful women, and enjoy Weland’s hospitality. Renmin Square: A bustling marketplace right in the center of Weland. Here, one can find anything from top notch weapons to fresh produce to beautiful clothing. This marketplace is always busy and it is always loud with shopkeepers trying to attract shoppers to their stalls. Teka District/ Rantou: This is considered one of the shadier parts of the city. This is where there is a market for unconventional weaponry, bootleg goods, and other services. The Rantou is an underground fighting ring that hosts high-stakes tournaments. The Teka District is found deep within Weland’s Western Quarter. Kabukicho: The theater district is dull of theaters, bawdy tea houses, and bars. Located in the Eastern Quarter, it is currently mostly abandoned, slated to be renovated. The plague hit Kabukicho harder than any other part of Weland. It is currently considered to be lawless land that is rarely patrolled by the Weland guards. Saezaeshita Hot Spring and Onsen: The waters from the hot spring are said to have healing qualities. There is no other place in Terrenus that has a feature that boasts this quality. The hot spring is a large tourist attraction, attracting people from all over Terrenus to experience the rejuvenating effects of the hot spring’s water. The mysterious nature of the water’s warmth and the fact that there is no actual source funneling into the spring is often chalked up as being a part of Gaia’s warmth or being part of one of Souzou no-Ookami’s strange creations. Xingjuan Garden and Quan Lake: This garden surrounds Okamura’s Grace and borders Renmin Square. It is a large city park with flowers and trees that are planted in a way that makes the garden constantly burst with color. The lake is a recreational lake that is used for fishing or canoeing. This is a very romantic spot. The current government consists of Chizuru Ryuzoji-Xanathi as the regent along with a council of five representatives from the five founding families. The council is made up of Masato Okamura, plus the other four holders of the guardian weapons of Weland: Ayako Torii, Yukimori Araki, Fumiko Bessho, and Ginzo Iwanari are the other four members of the council. Education is considered to be one of the most important aspects of Welander society. Schools are highly competitive with one another. Not only that, but students are also very competitive with each other. Weland is home to many private elementary schools that attempt to woo parents with high test scores and military curriculum. These are considered to be prestigious schools. However, most remain on par with Weland’s public education system in terms of military curriculum. Public schools in Weland focus mostly on learning of the military. At a young age, students are taught how to defend themselves without weapons. As children get older, they learn how to use weapons to defend themselves. The history of Terrenus, arithmetics, languages, and social studies round out the elementary school education. In intermediate school, students begin learning about trade and, in a lesser extent, economics. After intermediate school, students are given the opportunity to go to a trade school, continue to a military school, or continue to a school that teaches children about more scholarly pursuits that will lead them to further their education at a university either in Weland or beyond Weland’s borders. Excellence in education is stressed in Weland. Their reasoning is seemingly connected to the idea that each student who does well in school will be a benefit to the city of Weland. To do poorly in school is to be a humiliation to not just family, but sometimes even an entire school. Alienation is not uncommon to students who do poorly. A student who does well is a success, and each success is a contribution to society- from students who are just starting out in school at the age of 5 to students ending school at the age of 17 or 18. The idea that an excellent student will lead to a lifetime of personal wealth is not something that is heard of in Weland. A student that does well in school is becoming a productive member of society. Before a student graduates to move up to a different school, they must take exams that cover all areas that were taught in school. The average school day in Weland lasts from early morning to early evening. During exam times, students may stay at school for longer days in order to study. To fail an exam would be shameful for a student. There are occasional instances where students would hurt or kill themselves if they were to fail. However, students get the opportunity to take exams again after another year. While there are numerous elementary and intermediate schools scattered across Weland, there are only four very large high schools in Weland. Tenjin Academy: Students who do not wish to go to trade school and only wish to move on to a university would generally go to this school. This school has been split into two separate academies, both bearing the same name. This is the most popular school amongst those who graduate from intermediate school. The schools are divided between the Tenjin Academy of Science in the Southern Quarter of Weland and the Tenjin Academy of the Arts in the Northern Quarter of Weland. Curriculum in the Academy of Science focuses mainly on alchemy, biology, and medicine. The Academy of the Arts focuses on languages, writing, music, and other fine art. Tamonten Military Academy: While learning self-defense is drilled into the core of every student in Weland, the military academy goes further. Students learn about military history, in depth lessons about weaponry and technology, and strategy. Upon graduation of this school, most students enlist in the Terran military or they work for the city guard. Kanayama Trade Institute: This school has a short year, as most of the students go out on an apprenticeship. Students are expected to already know a trade which they would pursue. Many students that go to this school only go for about two years before they’re deemed successful enough to work full time with other people in their fields. Weapon and armor smithing is the most popular trade at this school, but careers based in the engineering field and the magitech assembly fields are becoming increasingly popular as Weland becomes a more modern society. Jade Lake University: Named after the lake that is found in the Xingjuan Garden. The university caters to students from all over Terrenus. Its curriculum focuses mostly on engineering and science related fields. Medicine is the most popular major. In all schools, religion is not something that is taught. This is not done as a blow to the Gaianism majority. The push to keep religion out of education is to immerse the student with real world logic. Michael Commager: Major in the Terrenus Military and captain of a Splinter Cell team. Michael is the youngest known ranked Major in active military service. Maira Xanathi: Colonel in the Terrenus Military and officer in charge of the Weland Gorge Military Base. A raid in the night: Three members of the Abbadon Triumvirate travel to Weland and investigate a recent raid by a band of centaurs, which has resulted in a farming family being kidnapped. The trio travel to the woods and eventually encounter the centaurs in their camp. The centaurs are subsequently mind controlled by one of the three Abbadon members, forcing them to become servants of the Triumvirate. Into the misty moonlight: A party enters the spire that has been haunting Weland. The journey to the top was dangerous with various skirmishes breaking out and powerful spells being cast. The spire's magic was found to be controlled by a kitsune and a youkai that were working together. A tuning fork was found upon the kitsune's body and after striking it against the floor, the spire fell. Those Meddling Kids! : A group is sent to investigate the Lightning Rail attack, but the evidence ends up being destroyed. Ushirodate: Two women from Genesaris arrive in Weland on a vacation. With the help of another woman, they manage to stop an army from a foreign tribe from invading Weland. However, a plague is spreading through Weland as a result of their miscalculation. A Cold Morning: Three travelers are sent on a mission to fetch a mystical garment from a village nearby Weland that is terrorized by vampires. Through some crafty thinking, the garment's delivery is no longer restricted, and the vampires are converted into a protective force over the city. Derailing Weland: A bomb placed underneath the train car by unknown individuals in travel detonates, killing a train car full of passengers and injuring countless others. The rail is twisted beyond use, and the car lands on the control tower, causing further damage and loss of life. If You Dig It: Weland is ravaged by two powerful monsters. The town guards respond and destroy the first beast. The second absorbs the remains of the first, though, and overpowers the town guards. An enigmatic organization, OiC, steps in and takes care of the beast. They even offer to help clean up (for a price). 30% of the city is ravaged; 45% of it suffers minor smoke and fire damage. Light the Pyre: The funeral procession of the now deceased Hotaka Okamura is interrupted by a terrible explosion, bringing Renmin Square down. Jericho and Ventis solve the crime and helped put a dangerous and well-connected man behind bars. They were made honorary deputies as a result. End Our Sacrifice: The Syndicate of Mercenaries visits Weland, who is at the time in peril from a shadow dragon demanding human sacrifice in exchange for their city's safety. They are successful in defeating the monster. The Lady of Day River: A ghost was identified as having been a young woman by the name of Bristarra. Thanks to the effort of a few brave young men, it was found that Bristarra's father conspired in her death and was in league with the now-dead captain. Hotaka Okamura discovers the bog that will become Weland. He envisions it as being a paradise for himself initially. Gradually, he runs out of money to fund the building of his own fortress on the wetlands and has to ask other samurai families for help. Leaping at the opportunity to have a better fortified location, four other families accept. They were all tired at being badgered by centaurs, undead, and angry fae folk. The construction accelerates rapidly. Hotaka Okamura converts to Gaianism and tries to get the other families to do the same. A quarrel breaks out, but construction continued. Construction finally finishes. Weland opens its doors to people, offering adequate housing that was unique compared to the clay homes that were the main source of shelter in surrounding cities. At first, housing was cheap, but despite this, very few people made the jump to live in Weland. Using force, everyone is finally converted to Gaianism. The Sazaeshita (spelling) Hot Spring is discovered. Over the next two years, the water is experimented upon and found to have curative properties. This causes people from surrounding villages to filter in, hoping to be able to make money off the water from the hot springs. The Hotaka Blossom opens in this same year. Hotaka Okamura dies. Okamura’s Grace and the surrounding gardens are built in his honor. They are finished two years later. The lower floor is transformed into a library. Taiji Okamura is appointed as regent and Taiji appoints Masato, his younger brother, as the director of defense. Taiji, in an attempt to eclipse his father, introduced many influences from the outside cities via trade deals. Over the course of a decade, Weland modernized. Many different races of people moved to Weland to aid with industry. Jobs were plenty as well as food. Yomigane no Ookami is the goddess of oaths and contracts. While the power is split evenly between four deities, she is one of the most important ones. She has been sealed beneath the Gaian Temple in Weland to be forgotten over the years. She has been recently freed and has imbued some of her power and will into a woman named Shigeko and her companion, Ichi. Her main artifact is a black bladed wakazashi known as the Pen of Yomigane. It is being kept safely by the Okamura. With the pen, Yomigane’s agents could and would be able to awaken Yomigane’s brothers and sister in the same manner that Yomigane was awakened. Meibatsu no Ookami is the god of retribution. Like Yomigane, he is a major god in the old religion of Weland. He still remains imprisoned, waiting to be freed by Yomigane’s agents. Shouraku no Ookami is the goddess of bliss. She has also been imprisoned and remains as such. However, statues of her likeness had formerly decorated the streets of Weland. She is not quite as powerful as Yomigane or Meibatsu, but she is definitely more popular. Souzou no Ookami is the god of creation. His likeness is often that of an older man with a long beard. His image was seen often in works of Weland art. He is seen riding a horse, carrying a large paintbrush. In the beginning, Souzou was feeling lonely. He waited an eternity for something to happen, but when he grew old, he began to create his siblings, starting with Shouraku. Shouraku made Souzou incredibly happy with her jokes and her songs, but she felt that something was missing. Shouraku convinced Souzou to create the first humans. First they were created in Souzou’s image. Shouraku became rather envious and convinced Souzou to make humans in her image. Together, the siblings created plants and animals to entertain the humans. After a while, the humans were causing harm to each other and to some of the animals, so in a rage, Souzou created both Yomigane and Meibatsu to govern the humans. Respectfully, they did and the humans became “tame” and more friendly. While Souzou and Shouraku worked in the background, Yomigane and Meibatsu governed the humans accordingly and peace was restored. Secretive temples are located around the city, dedicated to these four gods. There is one in each quarter, which people now believe connect the gods to the four cardinal points on a compass. These temples are said to seal the gods’ powers beneath the surface of Valucre. The only god that has been freed so far is Yomigane, in the east. Her powers have been granted to two citizens, but her weapon remains missing. It is said to be located somewhere in Okamura’s Grace along with the weapons of the other gods. The popularity of Gaianism and the frequent appearances of Gaianist Inquisitors have caused this religion to become more of something secretive.